When asked to think about virtual reality in training, most people would envision students wearing VR goggles, looking at things in the virtual space that no one else can see. 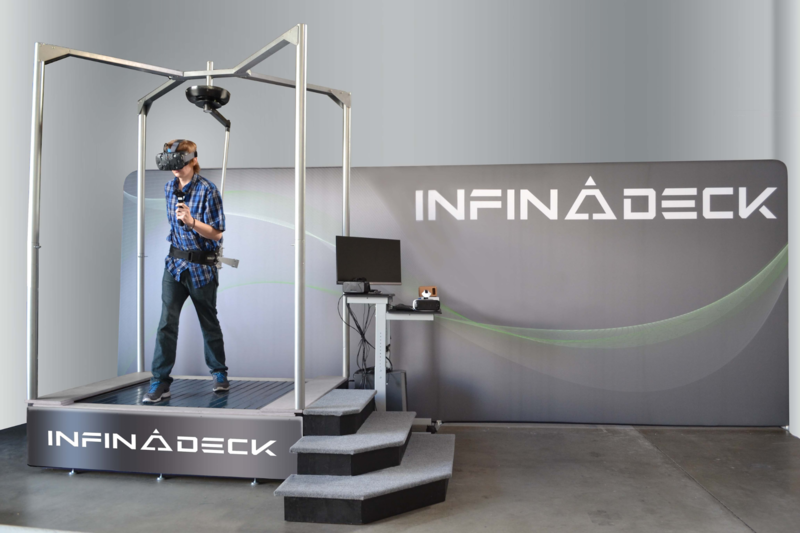 While headset-based VR experiences are often very effective at delivering content and engaging simulations, they still lack the immersion and realism required to make the user feel like they’re truly present in the scenario they’re training for. Entry-level VR setups often use headsets like the HTC Vive or the Oculus Rift, usually with accompanying controllers for each hand which give the user a deeper level of interaction within the simulation. Making the user feel like the lower half of their body isn't being left behind is a much more complicated matter—after all, even with technology to recognise lower body movements like running and walking, it’s unlikely users will be able to walk very far before hitting a real-life wall or pulling out a cable. The Virtuix Omni and the Infinadeck are omnidirectional treadmills that allow the user to move in any direction. They simulate the freedom of running and walking while eliminating the risk that comes with moving around a space while effectively blind. Incorporating this sort of technology sees an increase in immersion for users through the freedom of their entire body; their movements begin to feel more natural. However, these kinds of movement tracking peripherals do bring their own restrictions to ensure user safety, often requiring users to be secured within the device by a harness—not quite the freedom one expects when performing basic movements. Some learning environments with an increased need for realism have combined virtual and physical spaces to encapsulate their learners and create truly immersive training experiences. These experiences are commonly found in the form of advanced simulators, typically designed to recreate physical environments like the cockpit of an aeroplane or the front seat of a heavy mining vehicle. Using virtual screens as windows to the outside world, these simulators allow learners to intuitively study and practice with real-life controls like joysticks and steering wheels. Learners have the benefit of receiving accurately-simulated feedback in real time—providing a scenario which feels a lot closer to driving or piloting the actual vehicle. Additionally, many of these advanced simulators use hydraulics and other mechanisms to angle and shift the body of the simulator, replicating what would be felt when actually using that vehicle. Toll Helicopter’s ACE Training Centre provides a training experience that’s likely as close as a learner will ever get to a real-life scenario without leaving a safe, simulated environment. Specifically, the HUET (Helicopter Underwater Escape Training) provided by the centre offers a highly-realistic training environment for helicopter pilots, aircrew, and other specialist personnel—without the use of digital simulations. 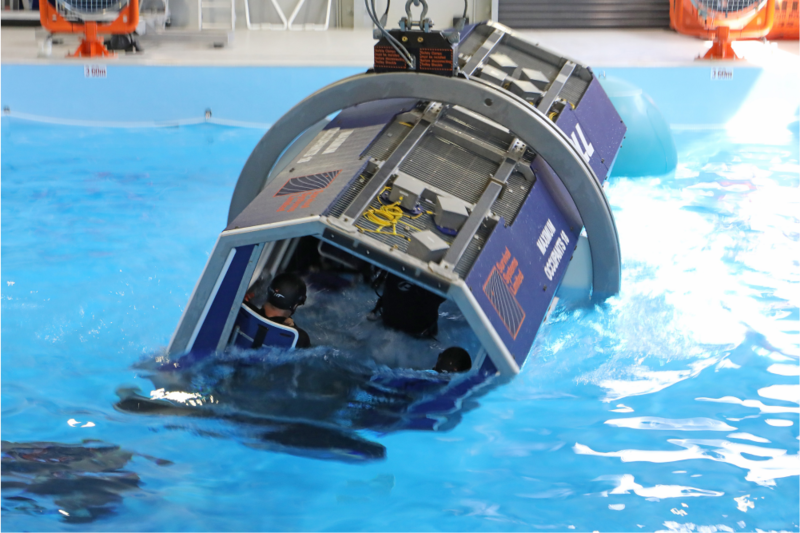 By recreating the fuselage of the helicopter and using a large pool as their ocean, ACE Training Centre is able to simulate a large variety of conditions like rain, waves, wind, and even noise. Being able to train in many different conditions is especially invaluable when you’ll eventually be operating in a real-life environment as volatile as the sea. It’s safe to say many types of training will come to rely on virtual reality in the near future, and both learners and RTOs alike will be chasing the most realistic training experiences available. Maybe it’s not in the budget yet, but forward-thinking RTOs should already be considering how virtual reality technology can assist in taking their training to greater depths of realism and engagement.